This track showcases projects from engineering and problem solving that feature significant levels of systems design. This includes notable examples of requirements specification, functional analysis, systems architecture, model-based systems engineering, or the use of modeling and simulation in the design process. This track showcases projects from defense- related projects that feature significant levels of systems design. This includes notable examples of requirements specification, functional analysis, systems architecture, model-based systems engineering, or the use of modeling and simulation in the design process. This track deals with methods and applications addressing the modeling of partially ordered activities to achieve a goal for systems existing in the real- world (process analysis) or not (processing engineering), to support effective design or systems improvement. This track deals with modeling methods and applications for representing static or dynamic characteristics of systems in order to support effective systems design or improvement, specifically for military applications. This track features projects that apply systems engineering principles and processes to solving problems. Emphasis is on correctly defining the problem, generating possible solutions, then choosing and implementing the best one. 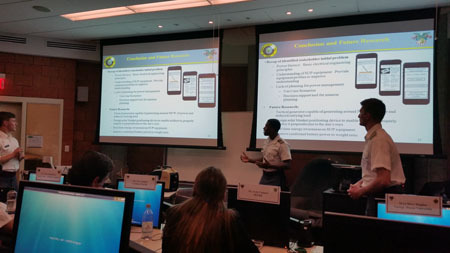 The Walter W. Hollis Awardbs annual competition is co-sponsored by the Department of Systems Engineering and the Department of Mathematical Sciences which recognizes excellence in military operations research and systems analysis. This track deals with evaluating complex non-repetitive decision opportunities by systematically examining values, uncertain variables, preferences, and alternatives. This track deals with modeling methods and applications for representing static or dynamic characteristics of systems in order to support effective systems design or improvement. This track features applications of engineering principles to operations and business practice. Presentations include engineering surrounding product development, manufacturing, construction design engineering, industrial engineering, technology, production, or any other field that employs personnel who perform an engineering function. This track features projects which utilize a significant modeling component used to support system requirements, design, analysis, verification and validation activities beginning in the conceptual design phase and continuing throughout development and later life cycle phases. Inventory Management Improvements for Iron Mountain Inc.